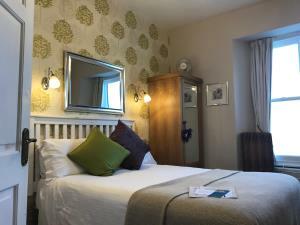 Hillsdale in Ambleside Guest AccommodationCreated from an original Lakeland Stone townhouse, each room is individually styled with no room the same shape or size, but each as comfortable and pleasing as the next! 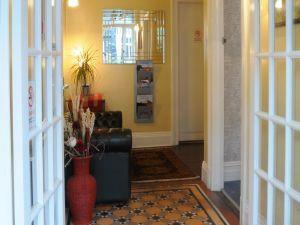 Double or king sized bed, new en-suite shower room and flat screen TV. Hospitality trays, hairdryers, wine glasses and corkscrew are standard. Free parking and Wi-Fi. Created from an original Lakeland Stone townhouse, each room is individually styled with no room the same shape or size, but each as comfortable and pleasing as the next! Leisure facilities with pool and outdoor hot tub, jacuzzi, sauna, steam room and gym one mile away. Children welcome from age 10. Hillsdale in Ambleside sometimes limits bookings to 4 or more days. A double room on the first landing at the rear of the house. 19" LCD TV. Double room sometimes limits bookings to 4 or more days. A room on the second landing at the rear of the house. The room has views over Loughrigg and The Fairfield Horseshoe. The room comprises a double bed, LCD TV and small en suite. King bedroom sometimes limits bookings to 4 or more days. Leave M6 jct 36, from the south, follow signs for Windermere and then Ambleside. From the north jct 40, follow signs for Keswick, then the B5322, St. Johns in the Vale, to Thirlmere and Grasmere and then Ambleside. Railway to Windermere and then 555 or 559 bus to Ambleside - 4 miles. Lovely room, made to feel very welcome.